Gardeners fall into two camps when it comes to evergreens – those that love ‘em, and those that hate ‘em. Some people find them boring, since they don’t flower, and mostly keep their leaves all year, with little color change as the seasons pass. Others love them for exactly the same reasons – they give permanent privacy, and provide a stable backdrop to the seasonal comings and goings of flowers and fall leaves on other plants. While it might not be possible to change their minds completely, if those ‘haters’ saw some evergreens that didn’t fall into the typical mold, they might at least partially move into the ‘lovers’ camp for a while. So with that in mind, let’s look at some interesting evergreens that bring something different to the garden, and don’t resemble the typical arborvitae, juniper or spruce tree. Now here is a tree that stands out among evergreens for lots of reasons, but the most interesting reason has to be that it isn’t – evergreen that is. Yes, it certainly is a conifer, like a spruce or pine, and it is a close relative of the famous Giant Redwood trees of California, which do keep their leaves all year round. The Dawn Redwood sees things differently, and belongs to an elite group of conifers that shed their foliage in winter. The others are the Larch (Larix), the Swamp Cypress (Taxodium), and the critically endangered Water Pine (Glyptostrobus) which grows in China and Vietnam. Being deciduous is enough to make the Dawn Redwood of interest, and of course it means it does not throw that dense winter shade that some people do not like, and that prevents many plants growing under evergreens. The Dawn Redwood tree has the tongue-twister botanical name of Metasequoia glyptostroboides, and until 1947 it was only known from 50-million-year-old fossils. Now there is a talking point when showing visitors your garden! The tree was discovered in China by staff of Harvard University’s Arnold Arboretum, and caused a media sensation when they brought it back to America. If its ‘living fossil’ status was all it had, this would probably not be a tree of long-term interest, but it is undoubtedly also one of the most handsome trees around, and certainly therefore a top-choice tree. It is also a gift if you garden on damp or wet soil, since it will grow happily in exactly those conditions. There, solved that problem for you. This is not a small tree, as it will grow to 50 feet in height, with an attractive conical form, and a spread of 20 feet or more. It will hold it lower branches for many years, so plant it where you don’t need to trim them up – it looks very handsome with branches reaching almost to the ground. The foliage of the Dawn Redwood is a little like that of a Yew tree, with soft, flat needles in two rows. They are a rich green, turning a dramatic rusty-red in fall. Use this tree as a unique specimen, or as a beautiful screen. It also clips easily into a magnificent hedge. 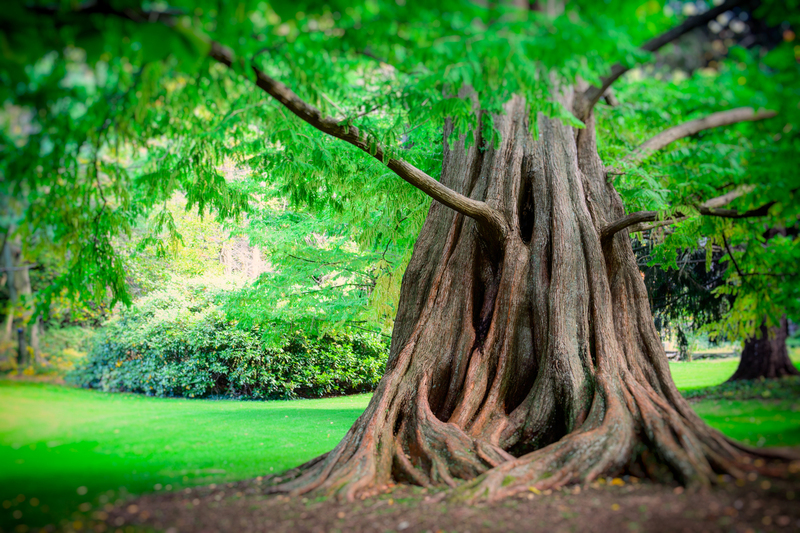 The Dawn Redwood – an all-round winner. Coming from much nearer home, this interesting native pine tree doesn’t have the usual pine tree look. The short needles are twisted in bunches at the ends of the branches, and the tree is broad and spreading, with a lot of ‘character’, even when young. There is a lot of talk and interest in growing native plants these days, but some are either hard to grow, or simply not very interesting in a garden. The Virginia Pine, Pinus virginiana, is certainly not hard to grow, in fact if you have poor, dry soil, and even clay soil, this tree will be right at home. Those are exactly the conditions it grows in all the way from Long Island to Alabama, and it will grow well for you in similar difficult spots on a larger property. Often dismissed as a ‘scrub pine’, in reality this is an interesting tree that is also so easy to grow that it’s a great choice for any low-maintenance garden. If growing native plants is something that appeals to you, then for ease of growth, this tree is a perfect candidate. Although when crowded in a forest this tree grows tall and upright, when planted in a garden with space around it you will see a broad, irregular tree develop. If you have an Asian-themed garden, this tree has just the right rugged look, and it is also popular for growing as a bonsai tree, because the short needles look perfectly in scale. Say ‘spruce’ to an evergreen hater, and they will immediately picture the classic, and over-planted Blue Spruce, and lose interest. Show them a Bruns Weeping Serbian Spruce and they will sit up and take notice. No one could ignore this remarkable tree, and a mature specimen, once seen, is never forgotten. Picture a slender column, but one that cannot find it way, and instead meanders and turns in random directions. The central leading shoot adds 12 to 18 inches a year, and from it, becoming longer and denser lower down the tree, are pendulous branches that hang straight down, adding 6 to 8 inches to their weeping form each year, until they reach the ground and spread out around the base of the tree into a skirt of green. You can attach your specimen to a tall stake – it will reach 30 feet or more in about that many years, so make that a very tall stake – and keep it more-or-less upright, or you can just let it free and allow this unique tree to do its own thing and twist and turn as it will. Whatever you do, every specimen of Picea omorika ‘Pendula Bruns’, to use its full name, will amaze you, your neighbors, and everyone else who sees it. The tree is named after the Bruns Nursery, Bad Zwischenahn, Germany, where it was found in 1955. It is hardy to zone 5 and easily grown in full sun in any well-drained soil. In 2007 the American Conifer Society selected it as their Conifer of the Year, and if they don’t know a unique and novel evergreen, then who does? What tree is pictured above, do you have it in stock? Its a Dawn Redwood, described in the blog. You will have to wait many years before it looks like the one in the picture, but even young trees are very handsome, and it grows as much as 2 feet a year. It is available here: https://www.thetreecenter.com/dawn-redwood/.